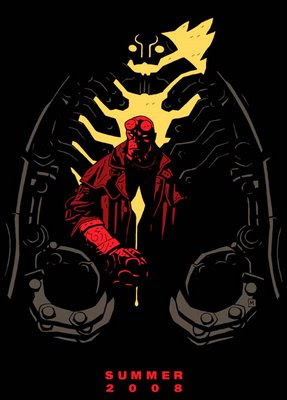 I love the first Hellboy film and, much to the incredulity of many, many people, consider it to be one of the best films based on a comic book ever made, if not the best. So for me to say that the sequel betters the original in almost every way would be to put some considerable praise upon its shoulders, but I think it could take the strain. Things start roughly a year after the end of the events in the first film. Hellboy (Ron Perlman) is experiencing a few first-year jitters in his relationship with Liz Sherman (Selma Blair), as well as causing head of BPRD, Tom Manning (Jeffrey Tambor) some considerable headaches as he insists on not sticking to the 'covert and secret' part of being in a covert and secret organisation. Things are further complicated by the plans of Prince Nuada (him from Bros), who plans to unleash the fabled Golden Army, a mythical horde of 70 by 70 indestructible golden machines, upon humanity, who he believes have reneged on an age old pact between them and his people, and it's up to Big Red and team, joined by new ectoplasmic member Johann Krauss (Seth MacFarlane) to stop him. Despite that rather lengthy synopsis, the plot of the film is actually quite thin and flimsy, and it'd be difficult to see it filling a one-shot if it was a comic. However, the film is not concerned with story as much as it is with characters, visuals and mythology, in some ways mirroring the development of Mike Mignola's original Hellboy comics (perhaps not surprising, given Mignola's story credit on the film). It is these aspects that comprise the real strengths of the film, but which also underline its weaknesses. Guillermo del Toro is a visual (some might say visionary) director, and the film is really an outlet for his imagination more than anything else; the whole film brims with ideas, to the extent that you sometimes wish that it would slow down for just one minute so that you could take it all in. The Troll Market, which is the backdrop for a few important story points and one brilliant fight scene, is symbolic of this outflow of imagination; it's like the Mos Eisley cantina, times a thousand. Everywhere you look, there's something happening, something you've not seen before, something that is just beautiful, strange and wonderful, yet most of it is only on screen for a few seconds. It's clear that, given a large enough budget, del Toro will just let his imagination fly, it's just a shame that the narrative requirements of the film require us to spend only a small amount of time admiring it, but at the same time quite thrilling to see that a big Hollywood film could be produced and have this sort of breathtaking vision to it. Take, for example, the tooth fairies seen early in the film; they're terrifying, yet cute, bundles of teeth and death and are really fascinating, yet they're on-screen for seconds at a time and minutes in total. Likewise, the stunning Angel of Death (Doug Jones, again) is a monstrous, beautiful thing, and one which hints at the possibility of a third installment, yet it's not really there for all that long. What's particularly impressive about the film's visuals is the amount of physical effects employed. Now, I'm not saying it's all physical, which would be pretty much impossible given the story being told, but del Toro really combines the physical and CG effects to stunning effect, creating creatures that really feel alive. One such creation, Wink, a giant blue troll with a nifty hand on a chain, is a particularly impressive creation, one which is augmented with CGI but whose power, physicality and character are mostly down to the fact that he's played by a guy in a suit. In fact, he's strangely sympathetic, given that he's just a thug hired by Nuada. This is the other strength of the film; its characters. Every character, good or bad, has a believable motivation and there's a real sense that del Toro understands and agrees with all their points of view. Nuada's quest is not just to destroy humanity, as Rasputin's was in the first film, but to protect his own people against extinction. He's not a character with huge depth, but he does at least seem to be motivated by something noble, even if it puts him on an opposite path to that of our heroes. Speaking of which, the rest of the BPRD gets a bit more breathing room this time; Abe (Doug Jones, now both the body and voice) gets a bit of romance with Nuada's sister, Nuala (Anna Walton), and their relationship is a surprisingly touching one, at that. Johann Krauss, as the new character, also gets plenty of time to breathe and provides some of the films funniest moments, thanks to a spirited vocal performance from Seth MacFarlane and a really sparky relationship between his character and Hellboy as they find themselves constantly at odds. Big Red himself is probably one of the weaker aspects of the film since, with everything that is going on, he sometimes gets shoved to the side. He's still a great character and Perlman gives it his all, but the film is much more of an ensemble piece than the first film and to see him sidelines, albeit only slightly, does seem a tad unfortunate, even if he still gets to handle the majority of the films action sequences. And what action sequences they are! Even though I do dearly love the original, I will admit that the action sequences could be a bit slow and clunky, but that really isn't a problem the second time around. There's a fluidity to the fights that makes them exciting, even when the characters are engaged in things that we've seen a hundred times before, like swordfighting, for example. There's a great sense of fun and lightness to things as well, but with a real sense that the fights are leading somewhere, rather than just being there to fill up the action quota. It's certainly not perfect; some of the performances aren't great and, as I've already said, the focus on visuals and mythology does leave the film with a somewhat thin story, but the positives more than outweigh the negatives. It's stunning to look at, one of the most visually inventive and unique Hollywood films of the last few years, if not decades, has some great characters, a real sense of fun and it even features a musical interlude! Roll on number 3. Also, it features an Eels song. Bet you can't guess which one.